The division of normal cells is precisely controlled. New cells are only formed for growth or to replace dead ones. 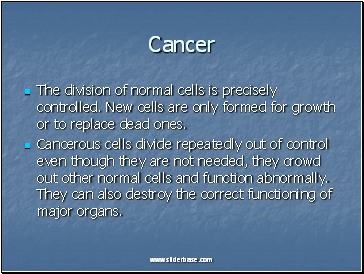 Cancerous cells divide repeatedly out of control even though they are not needed, they crowd out other normal cells and function abnormally. They can also destroy the correct functioning of major organs. Cancer arises from the mutation of a normal gene. 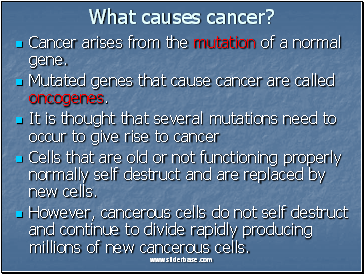 Mutated genes that cause cancer are called oncogenes. Cells that are old or not functioning properly normally self destruct and are replaced by new cells. 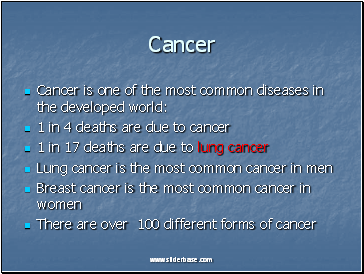 However, cancerous cells do not self destruct and continue to divide rapidly producing millions of new cancerous cells. 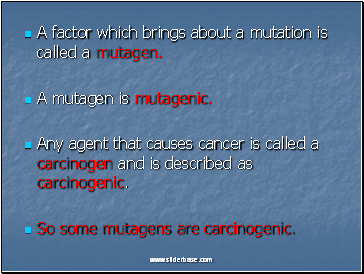 A factor which brings about a mutation is called a mutagen. 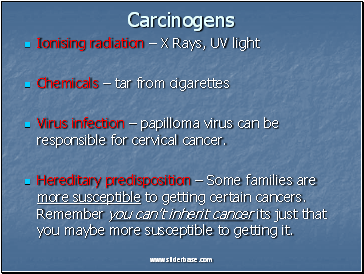 Any agent that causes cancer is called a carcinogen and is described as carcinogenic. So some mutagens are carcinogenic. Virus infection – papilloma virus can be responsible for cervical cancer. Hereditary predisposition – Some families are more susceptible to getting certain cancers. Remember you can’t inherit cancer its just that you maybe more susceptible to getting it. 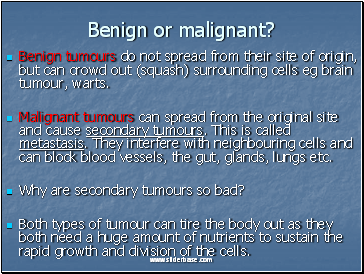 Benign tumours do not spread from their site of origin, but can crowd out (squash) surrounding cells eg brain tumour, warts. Malignant tumours can spread from the original site and cause secondary tumours. This is called metastasis. They interfere with neighbouring cells and can block blood vessels, the gut, glands, lungs etc. Why are secondary tumours so bad? Both types of tumour can tire the body out as they both need a huge amount of nutrients to sustain the rapid growth and division of the cells. 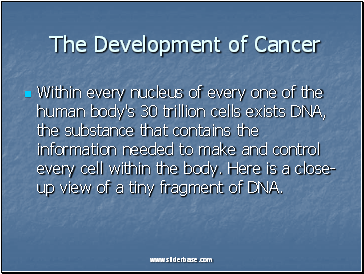 Within every nucleus of every one of the human body's 30 trillion cells exists DNA, the substance that contains the information needed to make and control every cell within the body. Here is a close-up view of a tiny fragment of DNA.